One of the numerous waterfalls in the upper lakes (Gornja jezera) region of the Plitvice Lakes National Park. 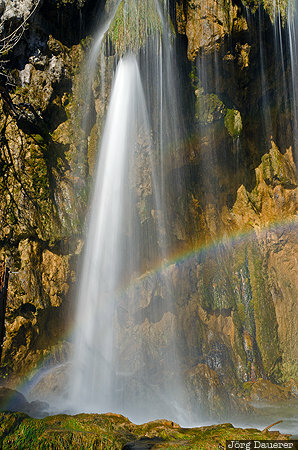 The morning sun creates a rainbow in the spray of the waterfall. Plitvice Lakes are in Licko-Senjska in the north of Croatia. This photo was taken in the morning of a sunny day in November of 2014. This photo was taken with a digital camera.